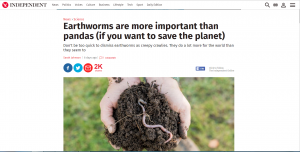 A: The earthworm article that I wrote is not directly related to my PhD – the PhD is looking at land use change, and the impact on biodiversity and ecosystem services. I think my interest in earthworms goes back to my childhood and digging around in the garden! Years later, I ended up digging around in the soils of a rainforest in Borneo (on a TBA field course), trying to find out what creature was creating these curious tower-like cast structures that littered the forest floor. I discovered they were made by earthworms, and that led to a pilot study on the role of these earthworms in nutrient retention, and how their activity changed along a land use gradient. I also just like earthworms! And I think their function is important, but undervalued – partly because people might not know why they are important. My background is in biodiversity conservation / sustainable land use, and I believe that we need to look at the whole spectrum of species, and the services they provide, when looking for solutions – and that soil and soil organisms are incredibly important. A lot of publicity, for good reason, is given to the more charismatic ‘cute’ species, such as the Panda, or the Orangutan, but arguably without the earthworms and other soil invertebrates making nutrients available for plants, there would be no forest for the Orangutan or Panda to live in. I wanted to make the case for less cute, but functionally important species with my blog. There is also a lot we don’t know about earthworms – for example, a new species of giant desert earthworm has just been discovered in Australia! Q: Have you had other articles published with The Conversation? A: This is the first I have had an article published by The Conversation, but I would like to try and write more when I have time. I think The Conversation is an interesting knowledge-sharing space. Q: Why do you think The Independent picked up on it? 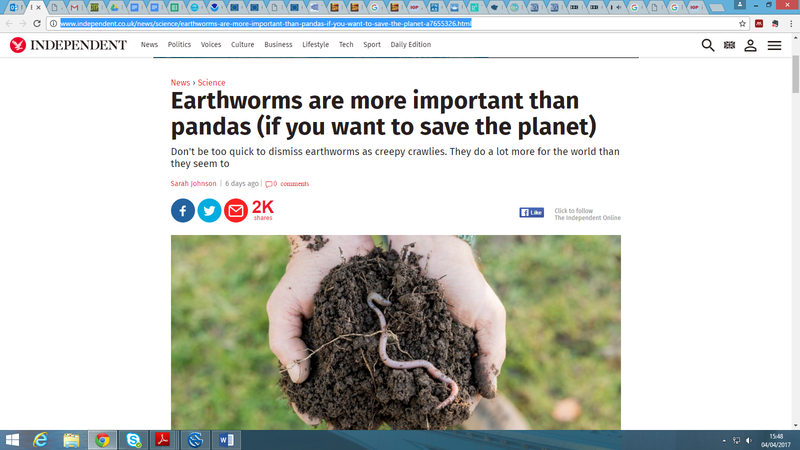 A: Perhaps the title caught their attention – you don’t usually get many articles raving about earthworms or saying they are better that the ‘cute’ panda! And possibly because every now and again there is discussion over whether so much money should be spent on panda conversation? Q: Any tips or advice for others who might wish to do something similar? A: Try and think of a title and opening paragraph that will get people (and editors) interested in reading more.Don’t be afraid to give it a go! Get writing – don’t let the fear of the first drafts being bad stop you from putting pen to paper. Everyone has something interesting to add to the conversation.t’s easier to engage readers (and editors) if you ‘write like you speak’ and don’t make it sound like writing. Use short sentences, avoid jargon, and use the simplest language you can. This entry was posted in Conservation, Ecosystem Services by Maha Mirza. Bookmark the permalink.